Most users ever online was 108, 11-01-2018 at 08:39 PM. The information described below pertains to the range when it was operational. After the attacks on the World Trade Center and the Pentagon, Goddard management decreed that no firearms were permitted on the center. In 2002, the lead was removed from the backstop berm. This required the removal of a section of the right side wall, and numerous overhead baffles. This has not been replaced, and the range remains closed. The club has a 50-Yard Range on the east campus of GSFC. The range has nine firing points, one that has a facility for mounting a Ransom rest. Targets are provided by the club and are stapled to target frames provided by the club. These frames can then be hung from the overhead baffle system at 1-foot intervals from 21 feet to 150 feet. The range can be used for handguns whose muzzle energy does not exceed that of a .44 magnum, all black powder pistols, and .22 caliber rimfire rifles. A Range Safety Officer as certified by the Vice President must open the range. The facility may be opened at 3PM on workdays, sunrise on weekends and government holidays. The range must be closed at sunset. 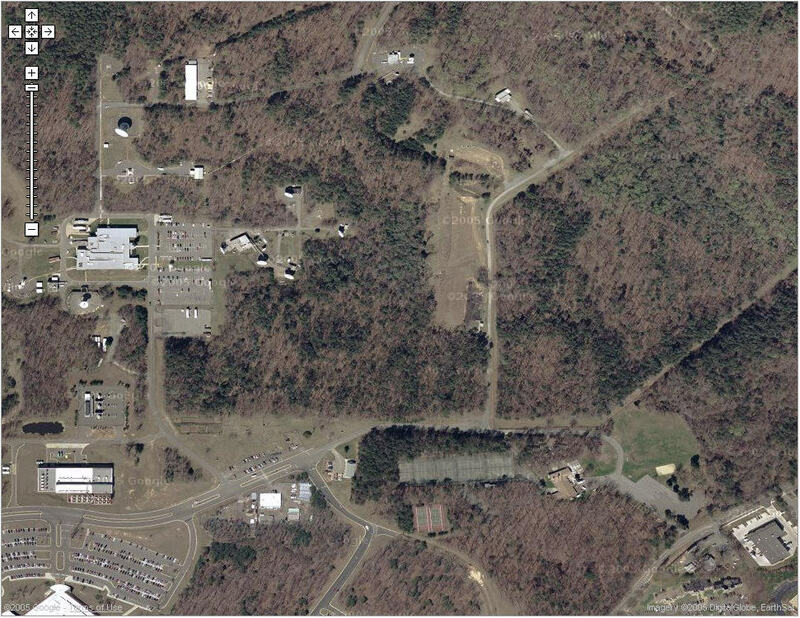 Occasionally, the range is closed for special events, training, maintenance, or GSFC code 205 security training. Directions - Enter gate 7 off of Soil Conservation Road, just north of the entrance to the new EOS data processing facility. Proceed through the intersection adjacent to the Garden Clubs gardens back past the Auto Club garage (building 95) to the next intersection at gate 12. Turn left at the intersection (just prior to gate 12) and proceed down the hill 400 feet. The range is adjacent to the left side of the roadway. DO NOT PARK IN THE DRIVEWAY UNLESS YOU ARE THE RANGE SAFETY OFFICER ON DUTY!!!!!!!!!!!!!!!! Picture of range under construction in March 1973. Click on photos or description for full image. In May 2008 the Club's on-site range at GSFC was demolished as part of the reconstruction effort on the east campus at GSFC. 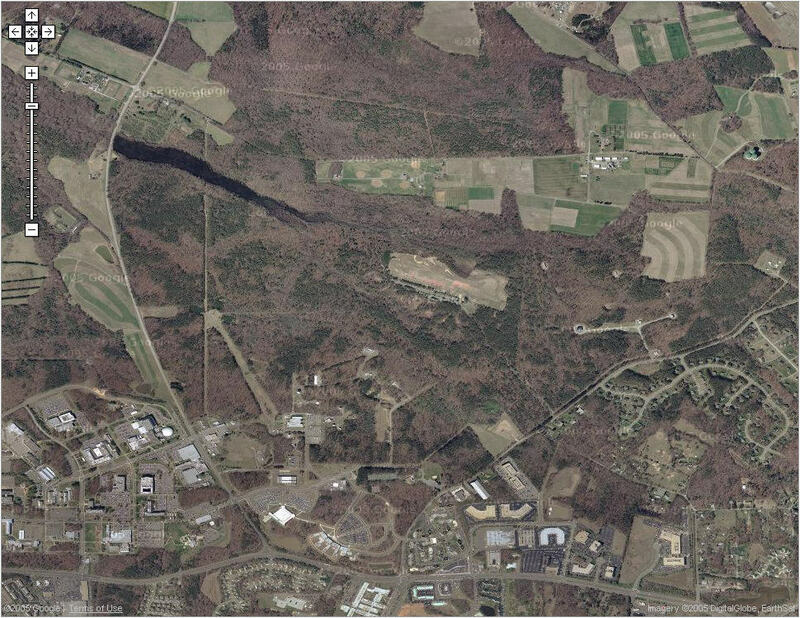 The range was originally shutdown by the then GSFC Center Director Al Diaz in the spring of 2001. All privileges require a current un-expired membership card in your possession. Members may not transport or possess firearms on GSFC without their valid membership card on your person. Members transporting or possessing firearms within GSFC without their valid membership card will be prosecuted by GSFC Security. NO FIREARMS SHALL BE UNCASED, DISPLAYED OR HANDLED EXCEPT AT THE RANGE. The Goddard Gun Club 50 yard range is to be used only for shooting at up to 50 yards for most (not all) pistols and .22 rim fire rifles. All shooters, regardless of past experience, will be briefed by the Range Captain (RC) or the Range Safety Officer (RSO) on duty prior to approaching the firing line. The range may be open, weather permitting, from 3:00 p.m. local time Monday through Thursday. On Fridays, the range will be reserved for instruction, if there is no instruction the range may be used by others from 3:00 p.m. until dusk. On Saturday, Sunday and Federal Government Holidays the range may be open from dawn until dusk. The range may be opened only by a qualified RC or RSO. Scheduled competition matches and tournaments have priority over informal shooting practice. All shooters not yet qualified to open the range may call Security at the Main Gate House (301-286-8661) to determine if the range has been opened. NOTE: GSFC Security schedules the 50 yard range four weekend half-days plus 2 contingency days during the year for training purposes (two during late April/early May, and two in October). The schedule will be posted as soon as available at the range or can be had by calling the Executive Officer. In addition, GSFC Security has the 50-yard range scheduled for 4 or 5 nights for night firing training. this does not impact Club usage at this time since the range is closed at dusk. All range facilities shall be restricted for use by current gun club members and their authorized guests only. A qualified RC or RSO shall be present and officiating at all times when firing is in progress. For the purpose of this document, when an RSO opens the facility, the RSO will serve as RC. All shooters shall sign the register book prior to using the range, indicating the time in and time out of the range. All shooters shall become familiar with the range safety rules and procedures prior to using the range. A safety check will be given by the RC to all new shooters prior to their shooting on the range. An inexperienced shooter shall be accompanied by an experienced shooter. All shooting shall be from the firing line positions at paper targets. Targets shall be properly placed on the target holders and in front of the backstop berm. No intentional shooting shall be permitted at or into the side berms, sidewalls, baffle system, supporting structures, sand bags or the in-field ground. Shoot only so that the projectile impacts the backstop berm. No "live" or "dud" ammunition shall be left on the range. Shooters shall police their area after firing by removing trash, "spent" casings, shells, boxes, etc. No smoking, drinking or eating shall be allowed on the firing line. All vehicles shall be parked in the designated parking area. The RC officiating shall park his vehicle in a close proximity to the firing line of the 50-yard range for use in an emergency. Alcoholic beverages and controlled substances shall not be permitted in the range area. Persons deemed "impaired" by the RC or RSO shall not be permitted on the range. Loud and abusive language shall not be permitted. The RC officiating over the range shall have absolute control over the facility and, at his discretion, may direct any other person to leave if his actions or behavior are deemed unsafe or unruly. All shooters and spectators shall wear eye and ear protection. Spectators without protection shall stand away from the firing line. Firearms may be transported on center by a current member if, and only if that member is going to use the range that day, or transfer the firearm using the club's Federal Firearm License that day. Firearms shall be carried in the locked trunk of the vehicle, unloaded, in a case and in a safe condition. Current club membership cards shall be carried while transporting firearms on center. (Members are responsible for complying with all Federal, State and Local laws.) GUESTS ARE PROHIBITED FROM TRANSPORTING FIREARMS WITHIN GODDARD PERIMETERS. No firearm shall be uncased, displayed or handled except on the firing line. All firearms on the firing line shall be handled in a safe manner. No one shall walk or move in front of the firing line for any reason except by the direction of the RC, who shall ensure that all firearms are unloaded with their actions safe. All firearms shall be unloaded with their actions and bolt in a safe condition until the shooter is on the firing line. Always point the muzzle in a safe direction, i.e., downrange. Dry firing of firearms is only permitted on the firing line with the muzzle pointed in a safe direction, i.e., downrange. While on the firing line, all shooters shall be subject to the commands of the RC. Handguns shall not be loaded with more than ten rounds at a time. Magazines may be tested under the cognizance of the RC. If a misfire or jam occurs, the shooter shall signal the RC (by raising his hand while keeping the muzzle pointed downrange) who will clear the firearm. At the "Cease Fire" command, all firearms shall be immediately unloaded and made safe. Prior to leaving the firing line, a shooter shall unload and make his firearm safe. Only handguns with muzzle energy equal to or less than a .44 magnum or .22 caliber rim fire rifles shall be fired on the 50-yard range. All shooters shall be qualified by a RC prior to the use of the range. All firearms shall be fired from the firing line. The use of armor piercing, incendiary, or explosive ammunition is strictly prohibited on the range. The RC has the authority to examine at any time any firearm or ammunition to determine its suitability for use on the range. When on the firing line, a shooter shall have only one firearm and its ammunition out of its case at a time. You may not fire strings at a rate that precludes your being able to aim each shot. Notify the GSFC Security Operations Center in person by stopping at the Main Gate house (Building 9, Room 9) or by phone at 286-8661, that the range is being opened. Raise the red flag up the pole. Place the road barriers in their designated places. Make the log available for all shooters to log on and off. Sign in the logbook, affirming the above. Brief all shooters of posted range rules. Secure all club equipment in the trailer. Notify GSFC Security that the range is closed. Personal Injury: Call 112 to secure aid. Return to the injured person and do what you can to help. Post a person, if available, at the top of the road to direct emergency vehicles. Fire: Call 112, then clear the area. Post a person, if available, at the top of the road to direct emergency vehicles.